Former council worker turned driving instructor Ehtesham Patel reveals why constantly improving and pushing yourself is essential to becoming a successful ADI. 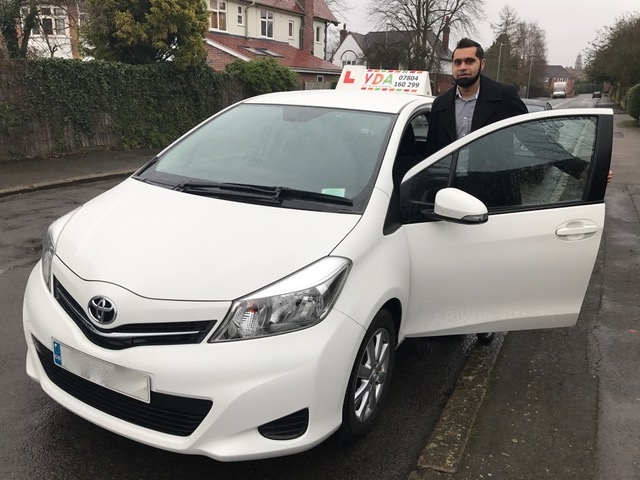 Owner of the Leicester-based Your Driving Academy, Ehtesham has been teaching learners since 2008 and puts his success down to adapting his teaching method to suit his students’ individual needs – and ensuring his team of ADIs always get the support they need. What did you do before becoming an ADI? My previous experience was in customer service roles – for instance, while qualifying to become a driving instructor, I was working for Leicester City Council delivering a frontline service to local residents. Whatever the job, I was continually developing my communication skills on the telephone and face-to-face, which has proven to be invaluable as a driving instructor and driving school owner. Why did you make the move into instructing? To be honest, I actually thought about a career in instructing while I was learning to drive! I can remember being in the middle of a driving lesson – I can even remember exactly where I was at the time – and thinking: “I’d love to become a driving instructor”. I love driving and being out and about, and the idea of teaching people essential life skills was really exciting to me – and still is. How did you develop your career? I started out as a franchisee for a local driving school where I learned a lot – for instance, how all driving schools were generally run at the time. To be honest though, I didn’t have the greatest experience; I wasn’t supplied with enough work and found myself struggling to make any profit with little or no support. Once my contract ended, I decided enough was enough and started up my own driving school – with my first child on the way, it was a huge and scary step. I committed myself entirely to the task and as the business grew, I started working with my first ADI and we haven’t looked back since! The school now has 10 driving instructors including myself. Growing the driving school hasn’t come without its own challenges though – being a good driving instructor isn’t enough. Some of the challenges include cashflow problems, time management (there’s never enough hours in the day!) and learning how to properly run a business. What has been your biggest professional learning experience and why? Changing my mindset and repeatedly stepping outside of my comfort zone by trying out different teaching styles and methods. Also, the day-to-day running of a business is a challenge, and writing and creating my new Learners Toolkit was something I’d never done before either but it turned out really well. I’ve changed my teaching style several times over the years and I continue to do so. The philosophy that lies at the heart of all my teaching though is to tailor the training to the individual and their learning needs. Most importantly, I have focused on simplifying the learning process; the way I introduce topics, break things up into bite-sized information, correct faults, even down to the wording and phrases I use. I go to great lengths to ensure driving lessons are fun and enjoyable and that my students meet their goals in each and every one. Critically, I realised very early on that I had a lot to learn and I have committed myself fully to continually boosting this learning. I still push myself constantly so I develop in every area as a business owner and as a driving instructor. Being an ADI can be lonely and finding the right help and support didn’t come easy to me especially in the early days as an ADI. As for the favourite part, I love making a positive impact on other people’s lives; empowering them with life skills and making learning to drive simple and fun. The best part though is aiding learners gain their independence by helping them pass the driving test. It is hugely satisfying! What practical advice would you give to new ADIs to ensure they don’t become isolated or are left feeling unsupported? I’d recommend newly qualified ADIs start with a franchise to kickstart their new career and have their diaries filled within a few days or weeks. Ideally, find a franchise that offers not only plenty of work but is very supportive in your formative stages. I make myself available to my team 24/7 – even when I’m on vacation. We also offer in-car support to all our instructors but if your franchisor doesn’t offer this service, I’d definitely recommend finding a local trainer to help. They can confirm you’re doing the right stuff and advise on what steps you can take to further develop and improve your training and working practices. How should a new ADI get the best possible start for themselves and their business? If it’s the first time you’ve been self-employed, seek advice from an accountant. You’re going to need to take some time out to get up to speed with running a business (even as a franchisee), i.e. what records you need to keep, important dates, managing your money, etc. There’s no such thing as a stupid question (that’s what we tell our learners right?). As first point of contact, you should approach your driving school for any advice and support. You’ll get to meet other ADIs at your local driving test centres and over time, you’ll develop good relationships with other local instructors as well. Remember that driving examiners are very approachable and I would encourage you to speak with them. Ask them questions regarding training, standards check and driving tests. What is the single most important piece of advice you would give an ADI about growing their careers? Commit to learning, improving and developing yourself as an ADI whether it be through BTEC coaching courses, training days, conferences, etc. This commitment to learning and developing helps unlock potential you never knew existed. Take personal responsibility. Finally, as a long term user of Theory Test Pro, how do you find the system helps your students? I believe Theory Test Pro is a huge help. It doesn’t cost students a penny, keeps track of their progress, is accessible anywhere at anytime and is available on practically any device – it prepares pupils so they can take their theory test with confidence. It’s also a huge help for us too because it adds value to our service and generates new pupil enquiries. It’s a win-win for everyone!